Learn patchwork from top to bottom with 14 fun projects Kids can quilt! 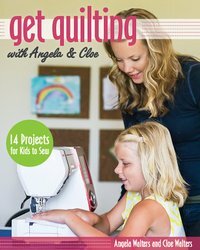 Best-selling author Angela Walters and her daughter, Cloe, join forces to teach preteens and teens the basics of quiltmaking. The dynamic mother–daughter duo guides kids step by step through making their very first quilt. Readers will tackle 14 projects to keep or give as gifts, including stylish bedroom decor, such as pillow covers, rugs, and T-shirt quilts. Angela’s eye for design and her approachable teaching style is the perfect complement to Cloe’s kid-approved fabric choices and projects. With skill-builders and plenty of how-to photos, kids can finally bring their imaginative creations to life!